Williamsburg is an area rich in history and tradition. So, when we decided to update Chelsea Gardens, we knew that would be our inspiration. The result is a new section that will have the look and feel of cemeteries from the past, but with modern conveniences—such as easily accessible pathways. The New Chelsea Gardens will feature traditional burial sites with granite headstones, brick pathways, and an amazing landscape design. It will also include a new area called Harmony Estates, which will encircle our existing scattering area, which is the brown marble wall shown in the above image. Harmony Estates will consist of eight private cremation estates that gently flow around a scenic shrub-lined circle. This is the ONLY section we offer that allows traditional granite headstones. It will feature 206 burial sites, which are designed for couples, 48 family burial sites (90% of which are sold), 12 cremation estates, and two sections for cremation burials. If you’re looking for a more traditional setting, the New Chelsea Gardens is the perfect choice. But, don’t delay. This may be the last time we offer this type of product. 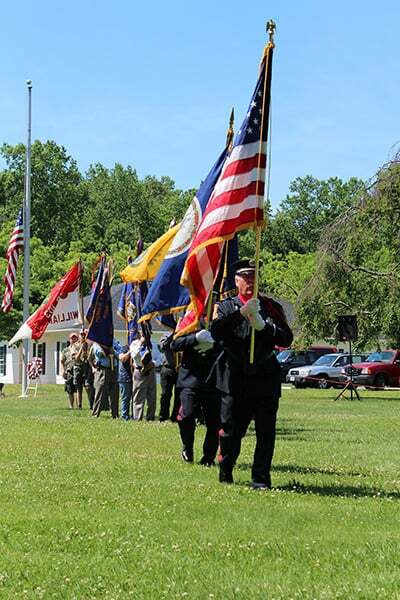 Williamsburg Memorial Park is committed to ongoing improvements that add value and beauty. 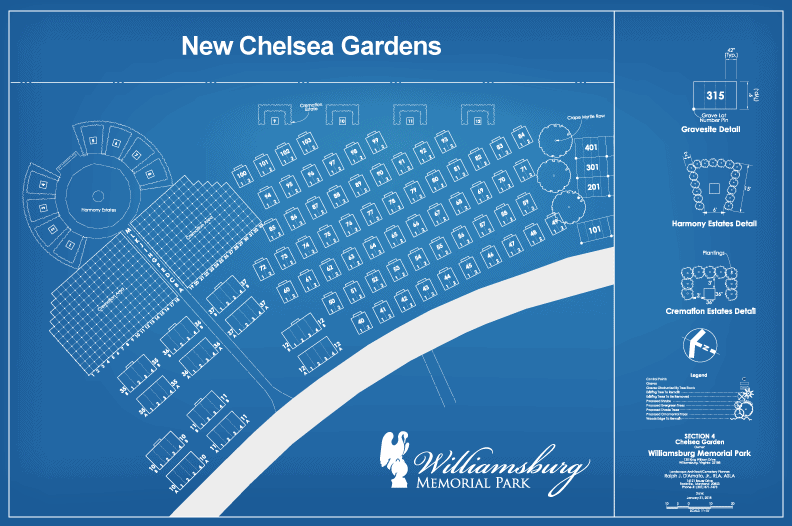 The New Chelsea Gardens is an important part of that plan. In the past five years, we’ve built a new Customer Care Center, added a brand new section (Cambridge Gardens), widened and paved our entryway, and have begun working on several upgrades, including New Chelsea Gardens. For a personal tour, please call our office at 757.565.2006. 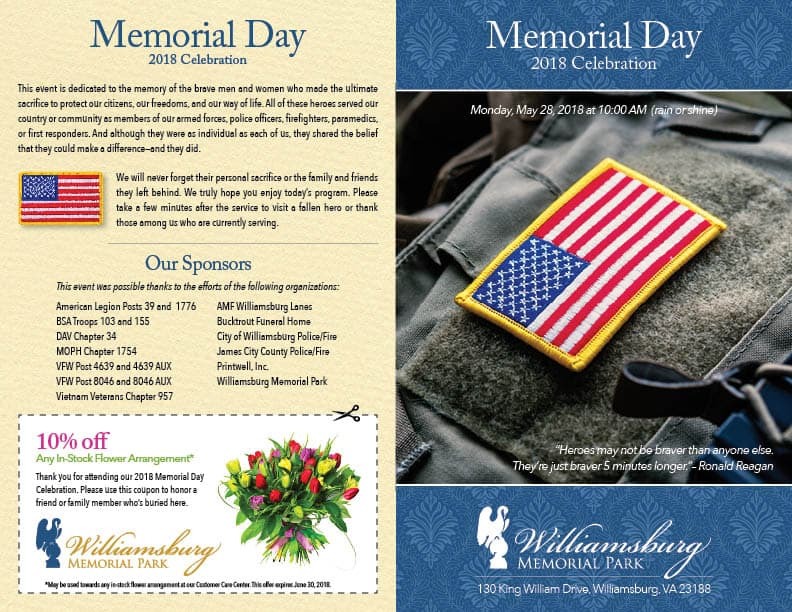 Williamsburg Memorial Park is committed to offering our customers the best value. We consistently beat the competition when it comes to price and service. For more information, and a no-obligation quote, please call one of our Family Service Counselors today or use our 24/7 Contact Form. And, be sure to check out our Special Offers page for our latest promotions. Due to extreme weather conditions, and for the safety of our guests and staff, Williamsburg Memorial Park will be closed Thursday, January 4, 2018. 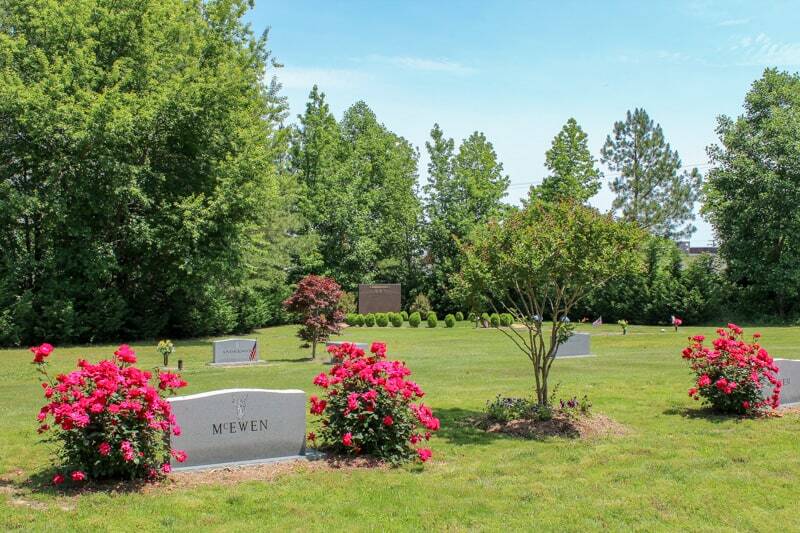 This includes our cemetery grounds and Customer Care Center. We will reopen Friday, January 5, 2018 at noon. We apologize for any inconvenience this may cause. If you have an immediate need, please use our 24/7 Contact Form and one of our staff members will get back to you asap. Although our cemetery is officially closed today, we invite you to view our Winter Tour video below. It happens every day. A family member is diagnosed with a serious illness. Friends and relatives arrive to help, but a few months later the family member succumbs to his or her illness. The mood suddenly changes from caring to chaos, as the family is forced to plan an impromptu funeral with little to no information about their loved one’s final wishes. The funeral director and clergy try to help, but in the end, they are simply guessing. As the number of decisions begin to mount, so do the expenses–all of which are due before the service is performed. The stress and financial burden continues to build, and the family, who should be peacefully mourning the loss of their loved one, is stressed beyond imagination. What if there was a better way? Thankfully, there is. 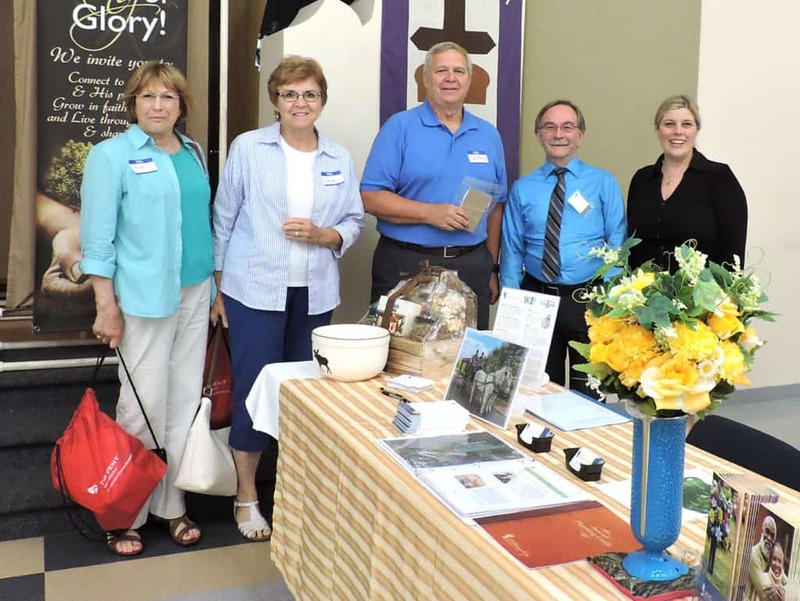 Last month, I participated in an end-of-life conference called, “Sensitive Journey II.” This wonderful event was held at the King of Glory Lutheran Church in Williamsburg, Virginia. In a comfortable group setting, local professionals shared ideas and advice about pre-planning with area seniors. Some attendees chose to ask questions in private, while others participated in a group Q&A session. It was one of the most productive and helpful conferences I have ever attended. In fact, I’m already looking forward to the third installment of this extremely worthwhile event, which is slated to take place in the Spring of 2019. But you don’t have to wait two years to discover the advantages of pre-planning. Our staff is ready to help you today. We’ll teach you about the entire pre-planning process–from the decisions you’ll need to make to the various burial, cremation, and memorization options that are available–all in the comfort of our new Customer Care Center. Talking about end-of-life decisions is never easy. But leaving your family alone with no instructions is worse. As my grandmother used to say, “no one is getting out of here alive,” and she was right. Save your family the emotional and financial burden of your death by pre-planning your funeral today. In closing, I’d like to personally thank the folks at King of Glory Lutheran Church for having the courage to tackle such a sensitive subject. To learn more about the benefits of pre-planning please visit the Pre-Planning section of our website or call us today at 757.565.2006. We look forward to helping you. 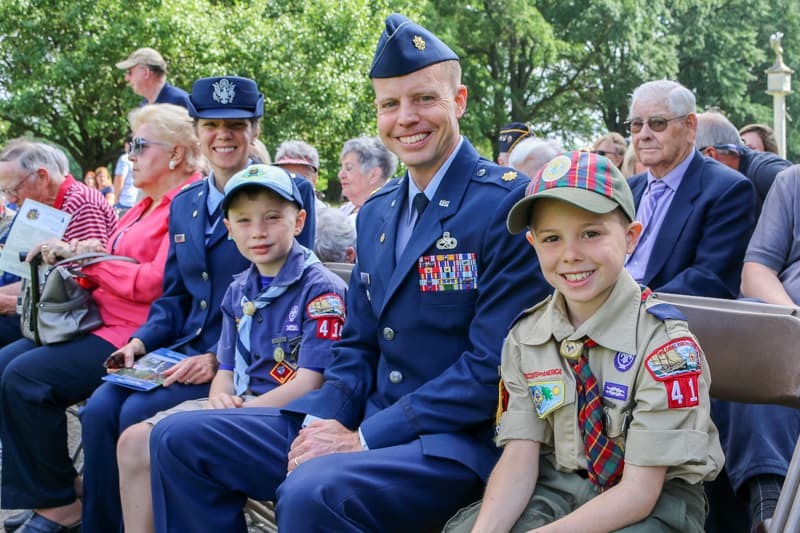 Join us, Monday, May 29, 2017, as we honor the men and women who gave their lives to protect our nation and its citizens. These heroes served as members of our armed forces, police officers, firefighters, paramedics, and first responders. 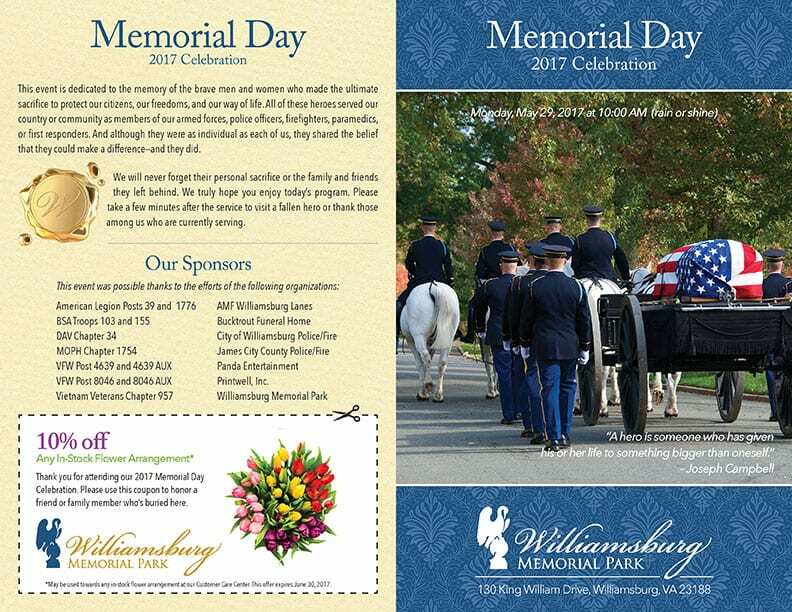 This event will feature patriotic music, an honor guard, a ceremonial wreath laying, a 21-gun salute, special guest speakers, and more. Programs will be distributed at the park or you can download one in advance from our website. Please try to arrive early for the best seating. Due to our ongoing Cambridge Gardens park expansion, ALL personal vehicles, except those with disabled tags, stickers, or placards, must park off-site at the AMF Williamsburg Lanes. A complimentary shuttle will run from 9:00 am to 12:00 pm to ensure everyone makes it to and from the celebration as quickly and safely as possible. For more information, please call us or visit our website. Click on the image below for a PDF of the 2017 program.